Augustus III, the King of Poland from 1734 to 1763 and Elector of Saxony from 1733 to 1763, was born 17 October 1696 in Dresden, the only legitimate son of King Augustus II of Poland and Christiane Eberhardine of Brandenburg-Bayreuth (1671-1727). He was groomed to succeed his father as king of Poland, and converted to Catholicism in 1721. He succeeded his father as elector of Saxony in 1733 and was elected king of Poland in 1734 with the support of Russian and Austrian military forces. Augustus died 5 October 1763 in Dresden, and was succeeded in Saxony by his son Friedrich Christian (1722-1763). Friedrich Christian ruled for only two months before his own death and was succeeded in turn by his son Friedrich August III (1750-1827). 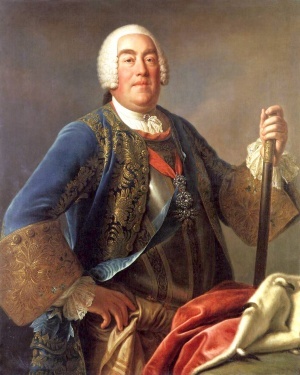 Augustus III was succeeded in Poland by Stanisław August Poniatowski, who ruled as Stanislaus II August. Augustus confirmed all previous privileges of the Mennonites on 16 April 1736. On 18 September 1750, at Warsaw, he extended the privileges that had been granted to the Werder Mennonites to apply to those in the lowlands at Graudenz, Culm and Schwetz. Most important was the complete freedom from military service granted them, for which privilege they paid a high protection fee. From 1741 to 1759 the Mennonites of Danzig had to pay 5,000 florins annually to the state treasury for freedom from military service in accord with an express edict of the king. In 1759 this fee was reduced to 2,000 florins, in 1774 to 1,500, in 1782 to 1,200 florins. But the Mennonites were never admitted to full citizenship. A rescript of Augustus III to the Danzig council even demanded that they should no longer be permitted to work at a trade and at business at the same time; they were to buy the materials for their manufactured wares from citizens, they were not to offer their finished products for sale, but were to sell them only to citizens; they were also forbidden to acquire any more land. Hege, Christian and Christian Neff. Mennonitisches Lexikon, 4 vols. Frankfurt & Weierhof: Hege; Karlsruhe: Schneider, 1913-1967: v. I, 96. Mannhardt, Wilhelm. Die Wehrfreiheit der altpreussischen Mennoniten: eine geschichtliche Erörterung. Marienburg: im Selbstverlage der Altpreussischen Mennonitengemeinden : in Commission bei B. Hermann Hemmpels Wwe., 1863. Neff, Christian and Richard D. Thiessen. "Augustus III, King of Poland (1696-1763)." Global Anabaptist Mennonite Encyclopedia Online. October 2007. Web. 20 Apr 2019. http://gameo.org/index.php?title=Augustus_III,_King_of_Poland_(1696-1763)&oldid=144753. Neff, Christian and Richard D. Thiessen. (October 2007). Augustus III, King of Poland (1696-1763). Global Anabaptist Mennonite Encyclopedia Online. Retrieved 20 April 2019, from http://gameo.org/index.php?title=Augustus_III,_King_of_Poland_(1696-1763)&oldid=144753. Adapted by permission of Herald Press, Harrisonburg, Virginia, from Mennonite Encyclopedia, Vol. 1, pp. 188-189. All rights reserved.